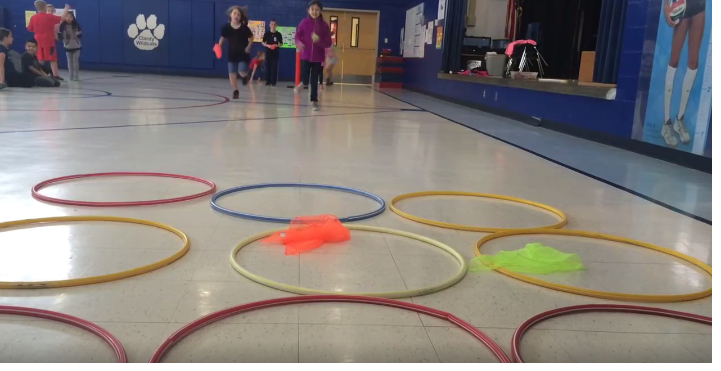 Hoop Rally is a game that is a great lead up to 4-square or Spikeball. 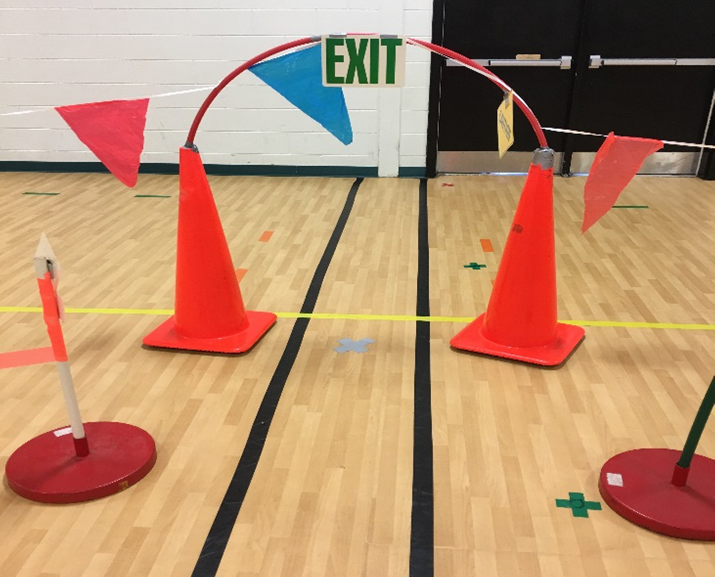 The objective is to continue to hit the ball into the hula hoop while attempting to prevent your opponent from being able to return it back into the hula hoop. *S&S sells a great combo pack with the hula hoops and their Super Bounce Smash-It Ball – works great for this activity! This is a 1 vs. 1 game. The games are played best of 3. The game will start by playing rock, paper, scissors to determine who serves first. The serve must be hit into the hula hoop, not thrown or slammed. Your opponent will then attempt to hit it back into the hula hoop starting a rally. The person that scores 2 points first is the winner. After a game is played, both students will find a new opponent or ball to use. You can have a winning side of the gym and a losing side. For instance, if you win, you go to the south side of the gym to challenge someone and if you lose, you will go to the north side of the gym to challenge someone. You can also play ladder style, so if you win, you move up to the next game, and if you lose you stay put. 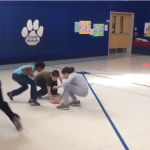 Games are meant to be played quickly where students are able to play several different opponents while using several different types of balls! 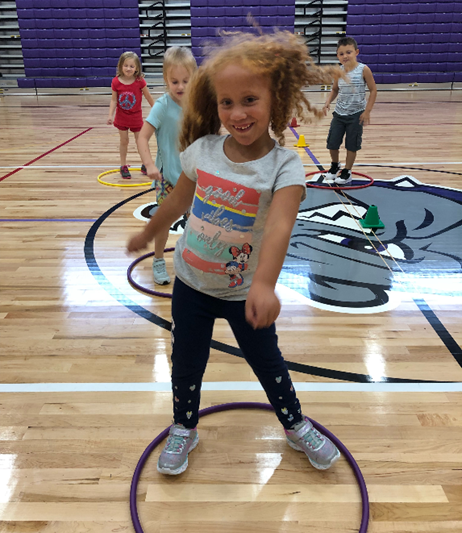 You can modify your game by allowing for double hits, playing with partners, or allowing an additional bounce after bouncing inside the hula hoop. 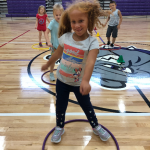 When playing with K-2 students you can introduce the lesson by having them bounce and catch the ball instead of using hits. 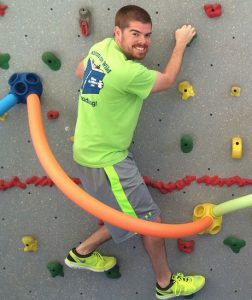 Matt Barrows is currently in his 6th year teaching Physical Education and Health at Clardy Elementary. He has many accomplishments at this school. He led a fundraiser to raise money for a 40-foot rock wall in their gym. ESPN sponsored their Donor’s Choose request and matched $4000 of the total cost. In his 3rd year of teaching, Matt was selected by his peers and received the Traditions of Excellence in Teaching award, then was chosen by the school district to be put in the Teaching Honor Cadre. They have 30 schools in the district and he was 1 of 12 chosen for the entire district. Matt also started an after school running club. Matt says he couldn’t ask for a better job where he can have hundreds of kids enjoy fitness! 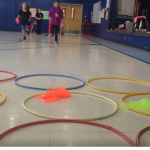 This entry was posted in Active Play, Hula Hoop, PE Activities & Games, PE Central and tagged hoop rally, hula hoop activity, Matt Barrows, PE activity, PE Central, physed, Physical Education by S&S Worldwide. Bookmark the permalink. Love the simplicity of the Hula Hoop game.